On the return trip, a deer crossed the road about a hundred feet in front of me. I whistled hello and kept walking. 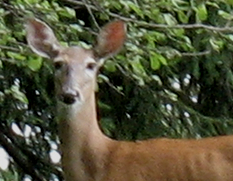 Later her fawn sprang across the road with only a little space between us. Such a stunning and lovely sight! 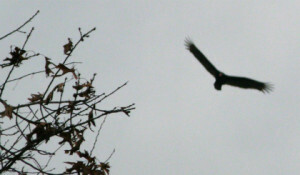 Next along my route, the buzzards began their nightly homecoming to an accustomed stand of trees. I whistled to them, too, mimicked their glide patterns, and tried for some photos. Alas—as usual, they were too distant and fast-moving for the capture of detail. Closer to home, a neighbor was picking up pecans under his trees. I pointed to his garden and asked, “Are you growing lettuce?” There were several rows of leafy greens. “No,” he said. 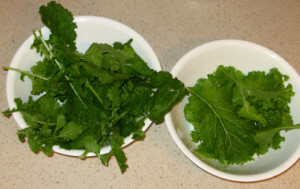 “Those are mustard and turnip greens.” He described which was which and offered to let me pick some. I did that, and brought plenty home to clean and eat. I haven’t looked up any recipes yet, but I did nibble the fresh leaves. The mustard tastes like something I know, only I don’t know which something that is. Radish? Horseradish? All I know is, it’s something. Most of today’s poem came to me at the boat ramp. Every day of life that includes wonderful things, time to think about them and share those thoughts, plus frequent periods of silence and mind-clearing is a great day for me. Lately I’ve been as eager and happy to end my days as to begin them. In other words, clearing my mind before sleeping is at least as delightful as filling my days with learning and adventure. The variety creates good balance… like youth and age, joy and sorrow.